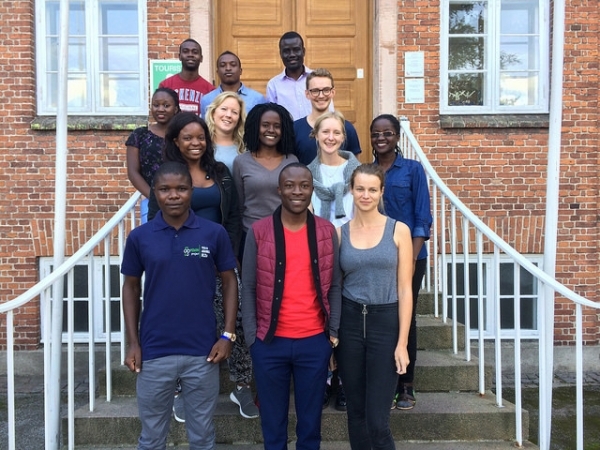 This fall 13 young people from Uganda, Zimbabwe and Denmark will be part of a Youth Leader Exchange Program funded by the Danish Youth Council (DUF). We are thrilled to have gained this opportunity since the youth leader exchange program offers a unique opportunity to add extra energy and resources to our partnership, project and activities. IMCC have two project groups namely IMCC IMUNZI (Zimbabwe) and IMCC Ashipti (Uganda) who have been engaged in a long-term partnership with youth organizations in Zimbabwe and Uganda. Together with their partners, they manage a community based health project. The aim of the Youth Leader Exchange is to have volunteers working fulltime on their project and together they form a team working together on specific activities and initiatives on the project. The 13 youth leaders began their project work by participating in DUF’s Youth Leader Training Seminar this august. During the seminar the youth leaders prepared the work on their project and established the best possible starting point for the collaboration. At the seminar, the youth leaders gained solid understanding of project management tools and attended workshops on group dynamics and intercultural cooperation. IMCC Ashipti collaborates with Federation of Uganda Medical Students’ Associations (FUMSA) and in 2016 they initiated a partnership project targeting Non-Communicable diseases. The aim of their Youth leader Exchange is to support the monitoring and evaluation process on their current health project. In addition, they seek to increase the advocacy activities and capacity building of volunteers in FUMSA by strengthening their project management skills. Read more about IMCC Ashipti oin Facebook or Instagram. IMCC IMUNZI collaborates with United Children of Africa (UNICA) and The Zimbabwe Medical Students Association (ZIMSA). Together they manage a partnership project and the objective is to lower the prevalence of HIV/AIDS transmission in Zimbabwe. The aim of their Youth Leader Exchange is to have volunteers working fulltime on the project and the Youth Leaders will make an impact analysis for project in order to explore lessons learned and use the results in their advocacy strategy. In addition will the Youth Leaders support the project and capacity build the volunteers in Zimbabwe in leadership skills. Read more about IMCC IMUNZI on Facebook or Instagram. The Danish Youthn Council presents videos and interviews with the participants at the Youth Leader Programme. It can be found here.